Back in 2010, when a group of construction, real property and bankruptcy lawyers first started meeting to consider potential revisions to North Carolina’s lien and bond statutes, one of the driving forces behind those discussions — particularly for those who typically represent subcontractors and suppliers — was protection for downstream project participants after an upstream player filed for bankruptcy. Such protection, known commonly as the “Bankruptcy Fix,” was included in the package of revisions signed into law last summer. This post explores the origins of the Bankruptcy Fix and discusses how the 2012 lien law legislation protects the right of subs and suppliers to serve a Notice of Claim of Lien Upon Funds even after a party above them in the contractual chain files for bankruptcy. I’ve Always Been Told “If It Ain’t Broke, Don’t Fix It.” When It Comes to the Bankruptcy Fix, What Was “Broke”? Good question, one that requires a short refresher course in certain aspects of lien law and bankruptcy law to answer. First, a few lien law notes. In North Carolina, not all mechanics’ lien rights are created equal. Parties in direct contractual privity with project owners (i.e., “prime contractors”), such as architects and general contractors, have a statutory right to assert liens against real property. Downstream participants who are contractually “remote” from owners also have lien rights against real property, but with strings attached. Although a full treatment of the lien rights available to subs and suppliers is beyond the scope of this post, it is sufficient for present purposes to note that first, second and third tier subcontractors can ONLY assert lien rights against real property if they FIRST serve a “Notice of Claim of Lien Upon Funds” up the contractual chain. N.C. Gen. Stat. § 44A-17 et seq. Now, some bankruptcy law notes. The federal statutes governing bankruptcy law arose from the need to balance the rights of creditors and debtors after a debtor becomes unable to pay its bills. Rehabilitation of the insolvent debtor — i.e., the debtor’s “fresh start” — became a central tenet of U.S. bankruptcy law. One of the core ingredients to a debtor’s fresh start is the “automatic stay” provision of the U.S. Bankruptcy Code, which prevents creditors from asserting claims directly against the debtor from the moment a bankruptcy petition is filed. The stay essentially pushes a pause button on collection efforts against the debtor, so that the bankruptcy court can manage the proceeding in a calm and methodical manner. The Suspense Is Killing Me. What Happened in April 2009 Giving Rise to the Need for the Bankruptcy Fix? Simply put, an interest in property of the estate against which a lien is asserted must be present pre-petition. Here, the Bankruptcy Code steps in and freezes rights where they stood at the time the bankruptcy was initiated, before the [l]ien [c]laimants accrued any property interests. Under this rationale, the post-petition service of a lien upon funds would constitute a violation of the automatic stay. This outcome was amplified in July 2009 by similar orders of the Eastern District Bankruptcy Court in two separate proceedings: In re: Harrelson Utilities, Inc. and In re: Mammoth Grading, Inc. So After April 2009, Subs and Suppliers in North Carolina Had No Ability to Enforce Lien Rights First Asserted Post-Petition? Not necessarily. 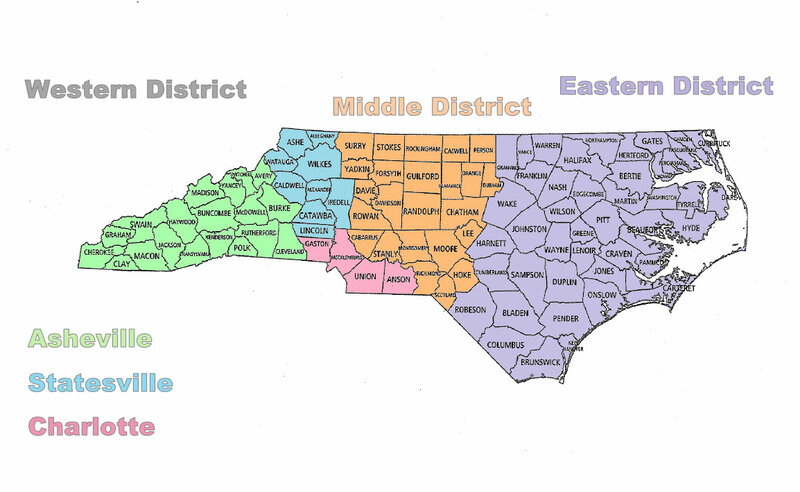 North Carolina has three federal court districts: Eastern, Middle and Western. This map shows the lines of demarcation for each district. The trio of decisions in the Shearin-Harrelson-Mammoth cases ONLY affected bankruptcies filed in the Eastern District Bankruptcy Court. While those cases may have persuaded the bankruptcy judges presiding in the Middle and Western Districts to rule in a similar fashion, those judges would not have been bound by what their colleagues in the Eastern District had decided. Different Results in Different Federal Judicial Districts Could Have Led to a Lot of Confusion in the Industry, Right? Bingo. A “fix” was sought as part of the lien law revisions not only because many believed the holdings of Shearin-Harrelson-Mammoth to be unfair to subs and suppliers, but also because the rules of the game could be entirely different west of Granville, Wake, Harnett, Cumberland and Robeson Counties. I ‘ve Heard That the Eastern District Bankruptcy Court Reversed Itself in 2012. Is that True, and If So, Was the Fix Still Necessary? While this course correction came as welcome news to subs and suppliers seeking payment for work performed in the counties comprising the Eastern District of North Carolina in the federal court system, it did nothing to prevent future inconsistent results in the Middle and Western Districts (or yet another reversal in the Eastern District). How Does the Bankruptcy Fix Work? A lien upon funds granted under this section arises, attaches, and is effective immediately upon the first furnishing of labor, materials, or rental equipment at the site of the improvement by a subcontractor. What Do I Have To Do To Take Advantage of the Fix? Nothing, other than serve your Notice of Claim of Lien Upon Funds in the usual course. The lien law revisions make it clear that the right to lien project funds exists from day one of your project performance, and that this right remains “inchoate” or only partially in existence until it is “perfected” by the service of a Notice of Claim of Lien Upon Funds in accordance with the form contained in N.C. Gen. Stat. § 44A-19. When Did The Bankruptcy Fix Take Effect? January 1, 2013, and it applies to all improvements to real property for which the first permit required to be obtained is obtained on or after that date. Does the Fix Guarantee That Federal Bankruptcy Courts Will Recognize Post-Petition Liens Upon Funds? Not necessarily. Could a bankruptcy court reject a post-petition lien upon funds served this year for a project that began last year, before the fix’s effective date? Sure, at least in theory. Might a federal court judge reject the statutory fix as somehow violative of federal bankruptcy law? Absolutely. While nothing is ever certain, the bankruptcy fix provides far more certainty than what existed before the lien law revisions were passed and signed into law. At a minimum, the Fix expresses the Legislature’s intent regarding the effective date of liens upon funds, and federal court judges are likely to find it difficult to circumvent that intent. What a great explanation of the new lien law changes. As a law firm which regularly represents material suppliers and specialty subcontractor in Georgia, I’m glad that our neighbors have adopted the bankruptcy fix!